Should Business Owners Leverage The Debt Consolidation Programs To Remain Debt Free? Since the economic recession, it is the business organizations that are suffering from lack of funds and are drowning in a sea of high interest debt due to non-repayment of their debt obligations. If you’re a business owner who is spending sleepless nights wondering about the escalating debts that are spoiling the reputation of your business, you need not fret as there are debt relief options that can help you get back a firm grip on your distressed financial situation. 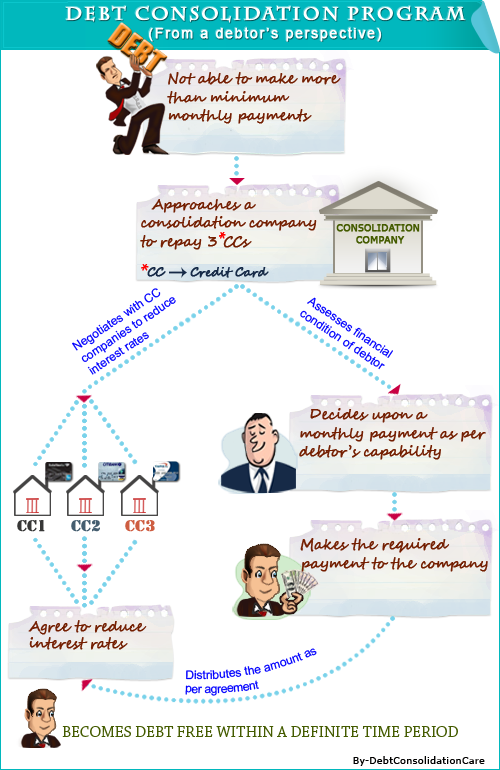 Debt consolidation is a repayment tool that has gained enough popularity among the individuals and the businesses in 2012 and the experts suggest that such firms will even gain momentum in the year 2013. If you wish to know the ways in which you can benefit while getting help from a business debt consolidation program, you’re probably reading the right article. What is business debt consolidation and how does it work? When a business has accrued a huge amount of debt due to poor business financial management or due to some unexpectedly large expense, the owner might get in touch with a debt consolidation company that offers programs through which businesses can get out of debt. The companies have debt consultants who are experts in offering financial help to the debtors who are not being able to manage their burgeoning debt level. They will sign you up with a program that offers a readjustment of the terms and conditions so as to facilitate the debt repayment procedure. There have been many business owners who have been able to get out of the mess through debt consolidation companies and if you too want to join them, read on the remaining concerns of this article. If you’re a confused business owner who isn’t aware of the benefits and the services that you might receive from a business debt consolidation firm, you should get yourself educated before you take the plunge. If you get help from a trustworthy debt consolidation company, their foremost job should be to assess your present financial state so that they don’t advise you before they even know your current financial state. They will check your income, your monthly expenses and then will advise you the steps that you can take in order to combat debt. The debt consultant will then negotiate with your creditors and lenders and tell them about the financial hardship that is barring you from making the payments on time. You can thereby stop contacting your creditors and this will relieve you of the hassles of taking calls. As soon as your creditors and lenders come to know about the hassles that you’re going through, they will change the interest rates and you’ll have to make a single monthly payment towards the debt consolidation program. They will keep on disbursing your payments to the lenders on time. The outrageously high interest rates are the reasons behind the large number of business debt defaults. When you seek help of a debt consolidation program, the interest rates will be lowered and therefore the monthly payments that you have to pay are much less than what you were paying before. You can therefore save considerable amount of dollars every month. Therefore, when you’re wondering about the ways in which you can bring your business debt under control, you can try combining your debts through a debt consolidation program. This will also help you boost your credit score as you end up repaying the total amount. Just make sure you don’t default on the payments as this might tarnish your credit score. Did you like this article? Write for the site. Sign up for our RSS. Rick Murphy is a financial writer associated with debtconsolidationcare.com. His expertise is woven around various aspects of the debt industry .With his articles he tries to impart to people the different situations and simple solutions to get out of difficult situations.